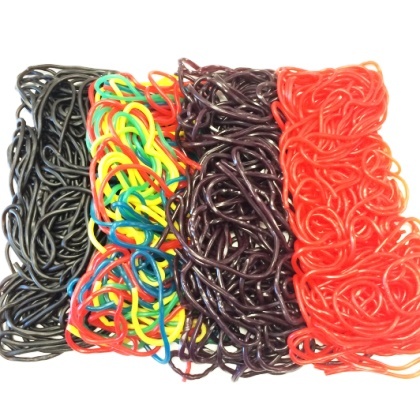 Delicious soft chewy laces in black licorice, strawberry, or rainbow assorted with red/strawberry, blue/blue raspberry, yellow/tutti frutti and green/apple. The texture and flavor is unsurpassed. Imported from Holland. Each string is approx. 33 inches long. 3 pieces per ounce. Shown in 6 oz portions. Grape has been discontinued. Finally! Strawberry String Licorice with TASTE! I love these laces! They're just like I remember when I used to eat them as a child. Tender & chewy & fruity! I also love the price. Thank you, I will be buying more soon.